Today I went to my Aunt Sharon’s house to hang out and quilt. Yes, she is very kindly and graciously helping me create a quilt. Actually, to be honest, she’s doing a lot of the work. So far, I’ve really just cut things. The first 3/7 rows of my quilt, sewn together. 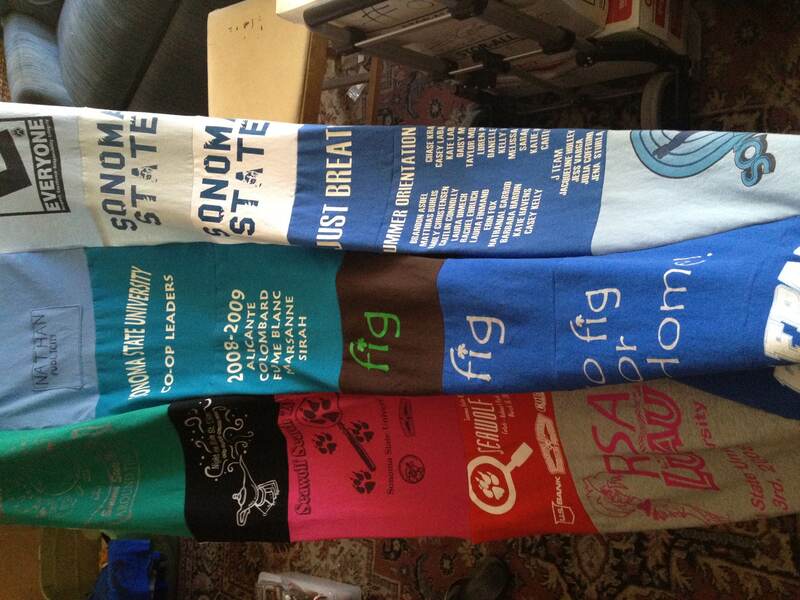 The quilt is composed of almost all of my t-shirts from my undergraduate experience at Sonoma State. We worked on it a couple weeks ago and got some of the shirts cut down to size, and all of them in the right order. Today, I cut the last of them down to size while my aunt began sewing the pieces together. I was surprised at how quickly she got one row together. Then another. Then another. As she finished them, I ironed the folds down. Then she started sewing the rows together. Two. Three. Four. As she was sewing five on we realized that we would need more shirts in the seventh row, cause we had moved some around. I started cutting one from high school that I still had. I was cutting them down to size on a cutting mat that was sitting on the floor with a rotary cutter – basically a pizza cutter for fabric. As I was cutting a smaller bit of the shirt to size in order to be sewn on to a bigger bit of shirt, I cut too small of a distance too quickly with my left index finger in the wrong place. As I drew the blade across, it rolled over my finger. Thank God for fingernails though, because without the fingernail, it would have been bad. It cut the nail badly enough far enough back that I started bleeding. It was only about halfway down from the tip of the fingernail. We were able to stop the bleeding, bandage the wound and eat dinner. I hung out for a couple more hours, then headed home. EDIT: It’s really difficult typing with nine fingers. This entry was posted on June 11, 2012 by Nathanial in Adventures!, Events.